Ladies fingers are deep fried, to make them crisp, along with pickling spices and sesame seeds to make this delicious pickle. 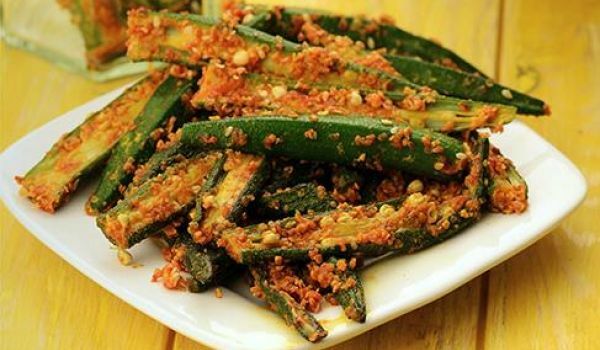 Bhindi Til Ka Achaar can be prepared with ease and is best relished with hot parathas. Clean the bhindis with water and dry them. Cut both the ends of each of the bhindis and then slit it lengthwise. Now take a bowl and put red chilli powder, salt, cumin, turmeric powder, mustard powder, a pinch of asafoetida and two teaspoons of lemon juice in it. Mix well. Now stuff the bhindis with the prepared mixture. Add curry leaves to the heated oil and saute for a minute. Now add the stuffed bhindis and salt according to taste. Cook till the bhindis turn roasted brown in color. Remove from the flame and pour the remaining lemon juice over it. Toss well so that the juice gets mixed properly with the bhindis. Sprinkle the roasted sesame seeds and store it in an airtight container in a cool place. Enjoy the spicy pickle after 3 days.